A new Pew Research analysis finds that 30 of the world’s countries (15%) belong to a unique group of nations that call for their heads of state to have a particular religious affiliation. From monarchies to republics, candidates (including descendants of royal monarchies) in these countries must belong to a specific religious group. This list includes Lebanon, which requires its president to be a member of the Maronite Christian Church. On Wednesday, Lebanon’s parliament will make a ninth attempt since May at filling the office. 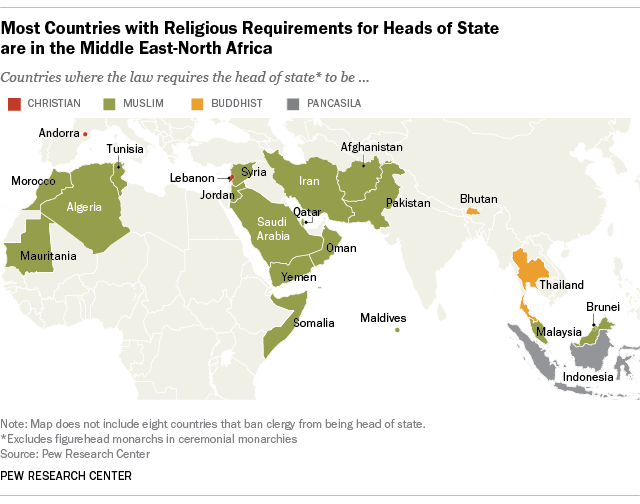 More than half of the countries with religion-related restrictions on their heads of state (17) maintain that the office must be held by a Muslim. In Jordan, for example, the heir to the throne must be a Muslim child of Muslim parents. In Tunisia, any Muslim male or female voter born in the country may qualify as a candidate for president. Malaysia, Pakistan and Mauritania also restrict their heads of state to Muslim citizens. Two countries, Lebanon and Andorra, require their heads of state to have a Christian affiliation. Lebanon also has a religious requirement of its prime minister, who must be a Sunni Muslim. Two other countries require the heads of their monarchies be Buddhist: Bhutan and Thailand. And one country, Indonesia, requires the official state belief in Pancasila to be upheld by its head of state. Indonesia is a Muslim-majority country; Pancasila is a summation of “common cultural elements” of Indonesia, including belief in God. A handful of countries do not require a particular religious affiliation for heads of state, but do limit candidates for the office to laypersons. Eight countries, including Bolivia, Mexico and El Salvador, specifically prohibit clergy from running in presidential elections. In Burma (Myanmar), the president is prohibited from being a member of a religious order. 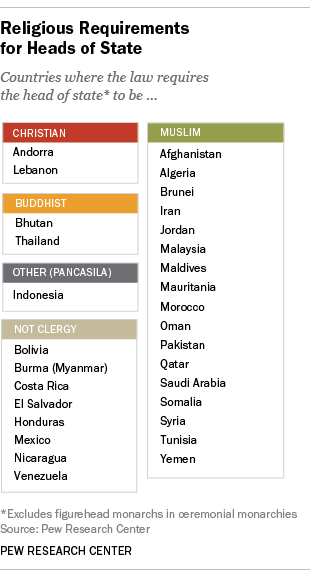 In addition to the 30 countries in this analysis, another 19 nations have religious requirements for ceremonial monarchs who serve as their heads of state. Sixteen of these, including the United Kingdom, Australia, Canada and New Zealand, are members of the Commonwealth of Nations with Queen Elizabeth II – also known as the Defender of the Faith – as their head of state. The other countries in this category are Denmark, Norway and Sweden. Most of the world’s countries (85%) allow citizens of any religious affiliation to be head of state. In the United States, the Constitution specifically prohibits any kind of “religious test” as a qualification for holding federal or state public office. At the same time, a number of states still have laws on the books prohibiting nonbelievers from holding office. However, the Supreme Court has ruled that First Amendment’s prohibition on the establishment of religion clearly prohibits states from requiring office-holders to profess a belief in God. This analysis was conducted through a coding of country constitutions – or basic law – and through reference to official country-specific government websites. Download the data used in this analysis here.